The Eclipse Band and Orchestra has been providing clients with the highest quality variety music and entertainment throughout Texas and the U.S. since 1977. The group has performed over 2,000 engagements, giving them unparalleled experience in knowing how to successfully orchestrate any function with the right kind of music for any crowd and any age group. And this is not just a band standing on stage—the highest quality performance and production values are always employed to give their customers the most entertainment value for their money. The Eclipse Band is a 6-piece group consisting of male vocals/percussion, female vocals, keyboards, guitar, bass and drums. 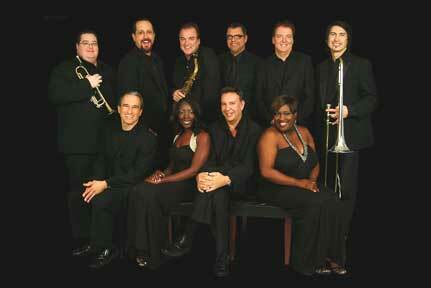 The Eclipse Orchestra adds a saxophone, trumpet and trombone to provide a 9-piece ensemble. Eclipse has always been known for its incredible variety of music, able to perform styles ranging from Classic Rock, Motown, Latin, Big Band, Country, Jazz and ethnic selections. Their musical and vocal talent is unsurpassed, allowing the musical material to be performed with complete authenticity. You can count on The Eclipse Band and Orchestra to always exceed your expectations. Experience, talent and production value make them the first choice for your special event. "What a FUN evening—and your group made it even more fun! Your professionalism is outstanding and your talent is truly unique. Please accept our appreciation for helping make our very special occasion and extraordinary, exceptionally memorable event!" "I'm writing to thank you for your wonderful contribution to the success of our daughter's wedding. You have a wonderful talent, and I can only hope that I have a chance to hear your group play again soon. Thank you so much for your contribution for the success of this event." "I have to tell you that I could not have been any more pleased with the Eclipse’s performance at my wedding. Our guests had the absolute best time. Their selection of songs caused 80 year olds and 20 year olds alike to compliment my selection on the band. I cannot count the number of times I heard, “This band is amazing! Where are they from?” In fact, two of our guests swore that the female vocalist was lip synching, her range was that incredible. I was especially impressed by their rendition of my personal request, Louis Armstrong’s “My One and Only Love.” Not only was this a treat for them to learn a new song just for Matt and myself, but to have them perform it so well, so authentically….we were elated. The Eclipse’s professionalism and talent far surpassed any band I have ever been associated with or heard before. I know that several of the guests requested their cards --- we’re hoping one of our friends will use them again so that we can enjoy their music sometime in the near future. Thank you again, from my husband and my family, for presenting such an outstanding band to me….my reception would not have been the same without them. Please pass on my compliments to Mark and the rest of the Eclipse. " --Best, Sarah Bullock McIntyre-Washington, D.C.